Some time ago, around March this year, Garbancita published in her enjoyable and stimulating I+D en mi cocina her discovery and application of a fabulous recipe based in chocolate, and I fell head over heels with it. In addition of being ridiculous easy to cook, it allows thousands of variations (see her blog to explore them, use Google Translate if you can't read Spanish), its results are delicious and is even funny to prepare. When providing your loved ones with these chocoballs keep in mind a couple of things: 1, they melt really fast, so keep them refrigerated and don't leave them out for long, and this leads us to number 2, you will rarely need to worry about that, for they are devoured from the face of the Earth at a speed only reached by some particles in CERN's Large Hadron Collider. Put the cookies in a freezing bag and crush them with the help of a rolling pin until you get a dark powder. Add the cheese a bit a a time, stirring gently. Put the mixture into the fridge for a quarter of hour. Get a handful of it and leave the rest into the fridge to avoid melting. 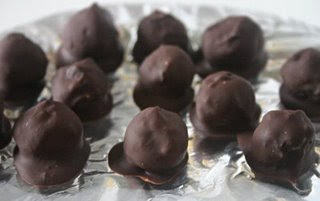 With the handful make balls of the size of a truffle (well, you can have a try with the Mythical Giant Truffle if you feel voracious;) and put into the fridge. Repeat the operation with the rest of mixture. Melt the chocolate, better with the bain marie technique (too many seconds in the microwave and say hello to burned choco-chunks...and no, they do not taste nice), and coat the balls with the help of a spoon or chopsticks (I recommend the chopstick, very comfortable and precise once you get used to them). Put them again into the fridge for drying, but afterwards keep them in a tupperware or tin box with aluminum paper to preserve their flavor and aroma. 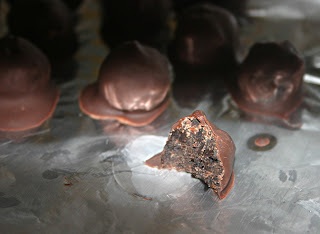 You can add to the mixture almonds, fruit confits, chocolate pearls, etc. Morgana prepared in El caldero del slot a hell of varieties that will inspire you for sure. Moreover, you can coat them in cocoa powder, sugar, grated coconut or almonds, or decorate with other type of melted chocolate.